As per our usual winter tradition - we are announcing our Melbourne Winter Skip Bin Hire special - where you get to keep the skip bin for up to 7 days at the price of 4 days. This longer bin hire period is very helpful during cold and rainy winter days in Melbourne, where due to rain - its is sometimes impossible to fill the bin or the project gets delayed for various issues. While we don't charge extra for the bin - if the bin is placed on a council property - such as road or nature strip - any extended hire might attract an extension of a council permit. Please contact us to discuss your council rates and the length of permits. 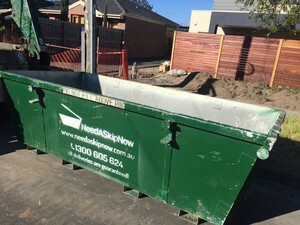 6m3 walk in skip bins - the most popular skip bins in Melbourne, our top seller, builders choice and equally popular bin among builders and residentials customers, can be used for soil, bricks, concrete, green waste, renovation waste and basically any type of mixed heavy or general waste. These bins are very competitively priced, especially for Mixed Heavy Builders Waste, starting from $517 for Melbourne Bayside areas. To get an instant bin quote for your suburb, please click here. 8m3 Walk In Skip Bins and Hook Bins - both very popular bin shapes. 8m3 skip bins aka Marell bins are higher and narrower (1.6m high and 1.5m wide), thus fitting into any driveway, while hook bins are a low hight rectangular shape (1m high and 2m wide), which are best placed on a road, in particular if being loaded with some heavy materials, to ensure no damage to your driveway. Some city councils, such as City of Boroondara only allow low sided skip bins on their roads, hence if you need an eight cubic meters bin on a road in a city of Boroondara then a hook bin would be the only option there as maximum bin height allowed is 1.5m high in that municipality. 10m3 Marell and Hook Bins - both walk in bins, same as above 8m3 bins - the difference between marell and hook is that Marell Bins are higher and Narrower (1.6m high and 1.7m wide), which is useful for sites where not a lot of space is available. The higher and more narrower bins are also useful for materials, which require height in order to fit them into a bin. The 10m3 hook bins are a very convenient 1m hight and 2m wide and ideally are placed on a road or on your building site, but we don't recommend driveways, as heavy bins can crack or have an impact on your driveway. When selecting between the marell or hook bin, take into account the type of waste you are getting rid of. For heavy waste, such as soil, bricks, concrete or a combination of the above, plus pluster, carperts, etc we definitely recommend a hook bin, as hook trucks have much bigger capacity to lift heavy bins. Ten Cubic Meters Bins are probably the largest size we would recommend to order for Soil, especially if you are loading with machinery. 12m3 Marell and Hook Bins - definitely builders choice and same as eight and ten cubic meters bins - Marell is narrower and higher, while Hook is low and rectangular. Mixed Heavy waste is definitely more suited to a hook bin, while 12m3 marell bin is more suitable for lighter materials and projects such as moving house, warehouse clean up, light waste building site clean up and can also be filled as half heavy and half light waste. 21m3, 24m3 and 31m3 Bulk Bins - all of these big boys are ideal for: Warehouse clean up, Demolition Site Clean Up, End of Lease Clean Up, Deceased Estate Clean Ups, Moving Parents into Retirement Village Clean ups, Hoarders and Trauma Clean Ups, also these bins are often used for large pieces of metal and plaster sheeting, which siimply won't fit into any other bin size. That's basically the wrap fellas, take advantage of our Winter Bin Hire Special in Melbourne and get your instant Bin Quote online or give the friendliest customer service team in Melbourne a call on 1300 605 624 and we'll answer any of your bin hire questions and help you choose the best bin size and shape for you!